Normally I can take or leave footballers autobiographies most of them are bland recitals of existing careers sanitised by publishing houses and football clubs keen not to have anything to derogatory or controversial in print. 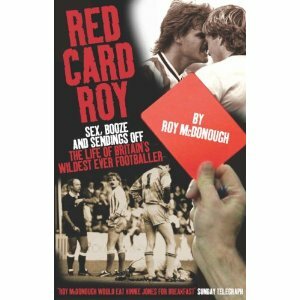 Then you get “Red Card Roy” the story of Roy McDonough, a player whose 20 plus year career spanned top flight spells with Birmingham and Chelsea down to the lower divisions with the likes of Southend United, Colchester and Exeter ending up in the non-league game with the likes of Heybridge Swifts. What sets Roy McDonough from an average footballer with a tale to tell is that his tale is worth telling, from the heartbreak of release from Birmingham as a youngster to a desperately lonely spell at Chelsea, Roy’s story is heart warming and evocative of an era where all night benders, untold female conquests and practical jokes were part and parcel of every football club in the land. Some of the tales recounted include the theft of Perry Groves’ pyjamas, a lass called “Fishy Mary” and drunken coach trips home from away games. Then there is the red cards, 22 of them, 13 in the Football League both still a record in English football. You thought Cantona was the first exponent of a kung fu kick at a British Football Ground then you would be wrong, ask Tony Pulis, scythed in two by Super Roy just 7 minutes into an FA Cup tie. Why? Just for being Tony Pulis. The great thing about this book is that Roy, like in his playing career, shies away from nothing and you get the lot, from his playing career, drink and disciplinary problems to personal and relationship break downs. Bernie Friend has done a truly outstanding job piecing together Roy’s rollercoaster career into one of the best footballer autobiographies of modern times. Highly recommended, however, please avoid if you are easily shocked! This entry was posted in Football, Southend United and tagged mcdonough, RedCardRoy, review, shrimpers, Southend, SouthendUnited, sufc by peterrmiles. Bookmark the permalink.